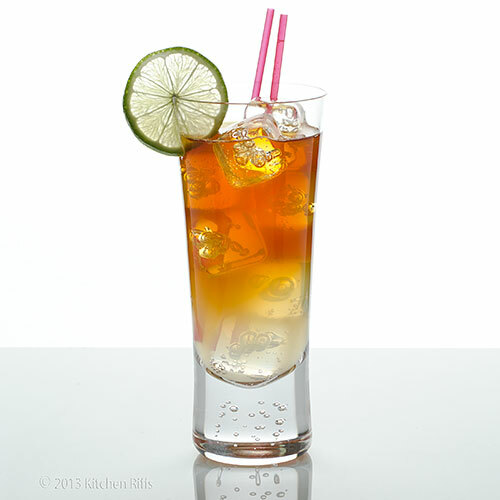 In the US, the Dark and Stormy is primarily a summer cocktail. It’s a tall cool one with terrific flavor. Carbonation gives it the refreshing and easy-to-drink quality of beer, while dark rum adds just the right amount of oomph. Add a squeeze or two of (optional) lime, and you’ve got a perfect picnic cooler. With Father’s Day coming up this weekend in the US, lots of people are planning cookouts and barbecues. 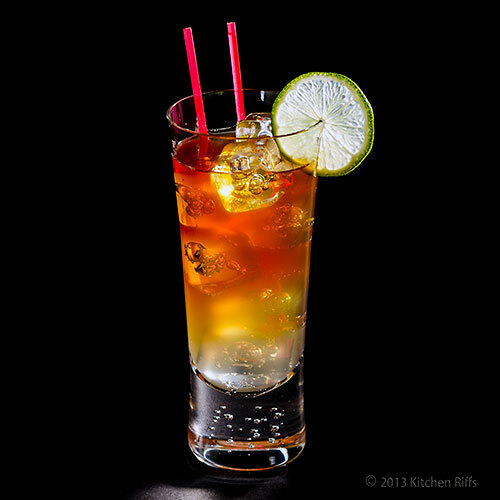 Why not add the Dark and Stormy to your menu? Despite the name, it’s a fun drink that will make your guests feel bright and sunny. Guaranteed! If you’re in a hurry, you can pour this drink by eye, with no measuring: Just put ice in a glass (preferably a highball glass — one that holds about 9 ounces or so), add dark rum, and top up with ginger beer. Then add a squeeze or two of lime if you like (not traditional, but tasty). That procedure makes a good drink. But you’ll get better results if you measure the ingredients (creating a more balanced blending of rum and ginger beer). 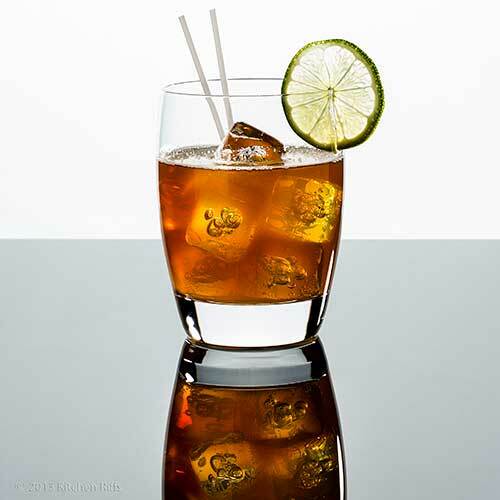 Most recipes call for either 2 parts dark rum to 3 parts ginger beer, or 2 parts rum to 4 parts ginger beer. I prefer the 2:4 ratio (it’s really a 1:2 ratio, but you know what I mean). Different brands of rum (and ginger beer) do drink a bit differently, however, so some experimentation is in order. I recommend using Gosling’s Black Seal rum (it’s traditional and widely available) and Gosling’s ginger beer. But there are lots of other brands out there, so (again) feel free to experiment. This recipe makes 1 drink, and takes a couple of minutes to prepare. Fill a highball or rocks glass with ice (you want to use a glass that holds about 9 ounces or so). Add the rum, ginger beer, and lime juice to the glass (see Notes for variations). Add a pair of straws, optional lime slice garnish, and serve. 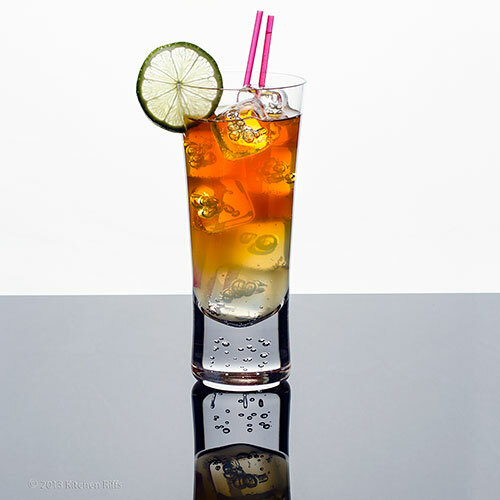 The makers of Gosling’s Black Seal rum have trademarked the name “Dark ‘n Stormy.” Yes, really! So by law bars have to use Gosling’s if they serve a drink by that name. For more information, see this 2009 article from the New York Times: The Right Stuff (by Law). But, hey, you’re making this at home. So feel free to mix it anyway you like (and call it a “Cute ‘n Fuzzy” if you want). Gosling’s dark rum and ginger beer do work great in this drink, but there are other good brands available. For instance, I haven’t tried Barritt’s ginger beer in this drink (it’s also from Bermuda), but it’s supposed to be sensational. Amanda and Scotty at the blog Chew Town swear by Kraken black spiced rum and Bundaberg ginger beer. And since Scotty is obsessed with the Dark and Stormy, his opinion is worth considering, I’d say. I’ve seen recipes that specify a couple ounces of dark rum with 5 to 8 ounces of ginger beer. Way too much ginger beer, IMO! Plus ginger beer can be more caloric than regular beer, so you don’t want to overdo it. I sometimes add the lime juice and ginger beer to the glass, and then gently pour the rum on top. That way, I get a nice dark “cloud” of rum that sorta floats on top, though it quickly blends into the ginger beer. Like root beer, ginger beer can be made at home. I haven’t gotten around to it yet (I will, someday). But in the meantime, if you’re interested, take a look at Jeffrey Morgenthaler’s recipe. We clinked our glasses to celebrate. Then I made us another round. It was an even-numbered day, after all. I've always wanted to try ginger beer and never knew that it wasn't alcoholic. But dark and stormy... Sounds so romantic to me. Wish I was in Bermuda. Hi Abbe, I believe you can find alcoholic ginger beers, but most aren't. This is a fun drink - definitely worth trying. Thanks for the comment. Hi Ray, this is really tasty! It's become one of my hot weather favorites. ;-) Thanks for the comment. Hi Kiran, thanks for the kind words, and comment! Hi Uru, it's a most delicious storm! And trust me, after one of these you really will be bright and sunny. ;-) Thanks for the comment. Now that is one good-looking cocktail, John. Your photos are simply wonderful. This is one cocktail I would really enjoy and would be perfect for a backyard party or barbecue. I need to shop for some ginger beer. Another item for my bar supplies list. Your title gave me a smile. Are you familiar with the Bulwer-Lytton Fiction Contest? It awards a prize -- "a pittance" -- to what the judges consider to be the worst opening sentence submitted. The winners are announced in mid-Summer and are always good for a laugh. Hi John, I do indeed know the Bulwer-Lytton Fiction Contest - it's a total hoot! This is a great cocktail for a backyard BBQ. We enjoy it so much we just bought some more ginger beer today - don't want to come up short! Thanks for the comment. Ah yes. It's summer, so the drinks are coming out! This looks like the perfect drink to sip by the pool. Yum! Hi Cathleen, summer drinks are fun, aren't they? ;-) And this is a wonderful pool drink! Thanks for the comment. Cost Plus sells a ginger beer that's fantastic. I bet it would be terrific in this drink. Hi Charlie, I actually used acrylic ice cubes for this shoot so they wouldn't melt! You can buy them on Amazon. I also have some silicone ice cube trays that make square ice cubes - very cool! Too bad about the antibiotic but it won't be forever. ;-) Thanks for the comment. Hi Kristi, isn't it a pretty drink? And I'll bet your dad would indeed love one! Thanks for the comment. Hi Kristi, I haven't had that, but I'll bet it would be good! Ginger beer has a nice flavor - I've never had one I didn't enjoy. Thanks for the comment. For some reason we always have a bottle of dark rum at the lake.. I need to try this one for Father's Day, I know Dave would love it! Hi Barb, it's a great drink - extremely refreshing. Have fun with it! Thanks for the comment. Right, ginger beer on shopping list this week. Must try this now especially as it's sitting around the pool weather here now. I love th ename of that cocktail! Very masculine. I've never seen Goslings rum (we tend to drink Ron Matusalem in our house) but this cocktail sounds delicious!!!! I love any rum cocktails with lime. Definitely trying this one. Thanks for the recipe John!! This looks so perfect for hot weather and BBQ's...I'd love to try this one! Hi Food for Feast, this is a perfect pool drink! Good flavor, highly relaxing, and quite cooling. ;-) Thanks for the comment. Hi Rosa, it's a great drink! I never thought of the name that way, but that makes tons of sense. ;-) Thanks for the comment. Hi Laura, I'm surprised Gosling's isn't more available in Australia - I believe this drink is actually fairly popular there. I don't know that rum, but I've never met a dark rum I didn't like! Thanks for the comment. Hi Ashley, it's a great drink! And a real refreshing one in hot weather - perfect for BBQ! Thanks for the comment. Hi Helene, this isn't a cocktail most people have had, but once they taste it, they'll have it again! Do source some ginger beer - you won't be sorry! Thanks for the comment. I love the ombre effect of this cocktail...sounds perfectly refreshing, too! Hi Carolyn, isn't this a tremendous cocktail? Ginger beer has wonderful flavor, and dark rum is delish too! Thanks for the comment. Hi Liz, it's a really pretty and fun cocktail. ;-) And quite refreshing! Thanks for the comment. Hi Laura, it's really worth trying this. Ginger beer has nice flavor, and the entire drink is so tasty. Thanks for the comment. John, are you willing to do a tutorial for how to take drink shot? No one can beat you for a perfect drink photography. I'm so curious your technique and secrets. ;) I'm thirsty looking at it. Your photo is WORKING! I must say, John, you couldn't have posted this enticing cocktail on a more fitting day. Here in the East it is indeed a Dark and Stormy Day. However, since I have been to the gorgeous island of Bermuda, it will be as easy as pie to imagine that I am there sipping such deliciousness. Hi Nami, glad you're thirsty! I hadn't thought about doing a tutorial, but I'll give it some consideration. Most of what I do is light from behind and block out any other light so I don't get unwanted reflections. The book, Light, Science, and Magic is a wonderful resource - but it's somewhat technical and not at all food related. But light is light and photography is photography, so once you understand the principles, you can apply them to anything. Thanks for the comment. Hi Louise, I've been reading that you're getting some really heavy weather today! Hope everything is OK where you are. And this is a fun drink to contemplate, even if you can't drink it. ;-) Thanks for the comment. Picture perfect cocktail ! Insanely seductive ! I almost had a heart attack seeing the first picture ! I love the name and it's a beautiful colour! That's pretty much all I can say because I can't drink it!! I am sure it's very good and if I was a drinker, I would probably enjoy it because I like ginger beer. Hi Suborna, I certainly don't want to cause a heart attack! Although this drink is, as you say, insanely seductive. Certainly worth a mild heart palpitation. ;-) Thanks for the comment. Hi Nazneen, I do realize not everyone is a drinker and won't be able to sample these cocktails. I rarely had a cocktail myself until a few years ago. I got interested in them because Eric Felten wrote a wonderful column in a newspaper, and until I read him I didn't realize how much cocktail history and lore there was. It was that, and not the flavor of the drinks, that got me interested in tasting them. Of course once I did taste them there was no turning back! Thanks for the comment. I love the name of this drink. Sounds refreshing. Love your pictures. Hi Dawn, isn't this a fun drink? It really is extremely refreshing! Thanks for your kind words, and comment. Boy did I need this drink this week. It's been dark and stormy and I've had to much to do that I could have used one or ten of these. Hi Maureen, this drink is sure to brighten up your day! But ten? Better wear sunglasses! ;-) Thanks for the comment. I have been drinking rum and coke for many years but have never thought of using ginger beer instead. I often drink ginger beer and yet it never occurred to me. The drink looks so lovely and the name is great. My perfect cocktail! Hi Suzanne, I was thinking of your love for rum when I was writing this post, and thought this drink might be one you'd enjoy. I think you'll love it! Thanks for the comment. Fantastic presentation. I love the bubbles in the icecubes and in the the glass and the cloudy part of the lemon juice that separates from the run and ginger beer. Beautiful. Hi Bam! It' a totally fun drink — I think you'd enjoy it! Thanks for the comment. Hi Purabi, isn't this nice? I love dark rum, and it really shines in this drink. Thanks for the comment. Oh I love the combination of rum and ginger but I've never had this specific cocktail. The local coop sells a delicious ginger beer so it looks like I'll be picking a pack this week. Love this cocktail! Thanks for another choice to kill this heat we're experiencing down here. Hi MJ, it's gotten pretty hot here, too. So Mrs K R and I have been drinking a few of these. ;-) It's really delish - I think you'll like it! Thanks for the comment. Hi Terra, ginger beer has a nice, spicy flavor. It's great in this drink, and so nice for hot weather (and BBQ!). Thanks for the comment. Hi Marta, when I was a kid root beer was one of my favorite flavors of soda! And I still like it, although ginger beer is really more interesting. And excellent in this drink! Thanks for the comment. Hi John, I'm very impressed with your photography skill. Those pictures are really excellent, very professional. The drink look awesome and very refreshing. Perfect for our current hot and humid weather plus the heavy haze. Thanks for sharing the recipe and useful notes. Have a nice Sunday, regards. Hi Amelia, it's a wonderful drink, and so refreshing in hot weather! Thanks for the kind words, and comment. Oh man this is just stunning. It's actually dark and stormy here today so I can just picture myself sitting on a covered deck sipping away. I've never seen any one take better drink photos than you. You just capture them beautifully, without all the glare. It's wonderful. Hi Kim, this is a totally awesome drink! And if you skip the rum (which admittedly is skipping a lot), this is a drink you can have - just combine the ginger beer and lime juice. Thanks for the kind words, and comment. Love your Dark and Stormy post - and thanks for the Chew Town mention! Scotty was totally stoked. Hi Amanda, it's a great cocktail, isn't it? Happy to mention Chew Town - your post was loads of fun! Thanks for the comment. Anyone have a appetizer or hos D'Oeuvres they can suggest for pairing? Hi Anonymous, loads of choice, but you might want to try Crab Rangoon or Cheese Straws. Thanks for the comment.